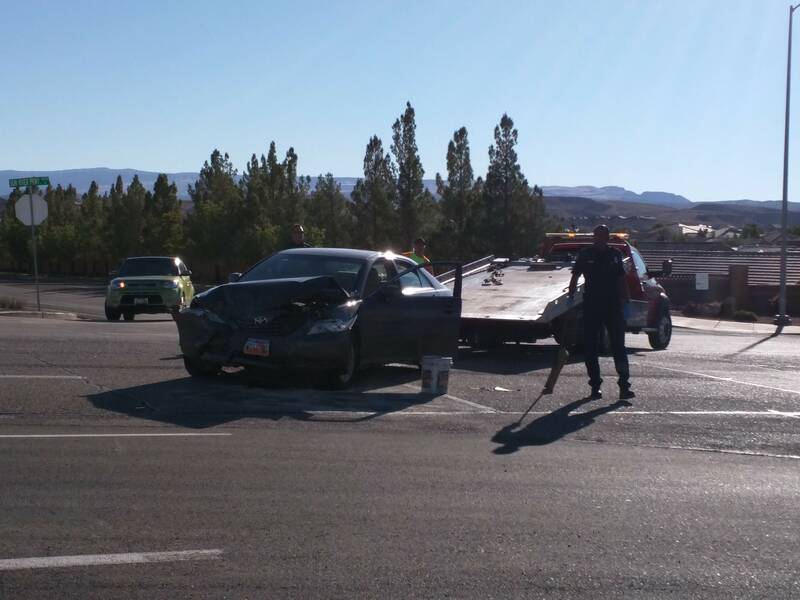 ST. GEORGE — A woman was transported to the hospital after a two-vehicle crash in the SunRiver community Monday afternoon. Emergency personnel responded to the crash involving an adult woman in a Toyota Camry and a juvenile female driving a Honda Accord at the intersection of Arrowhead Canyon Drive and Sun River Parkway at approximately 4:30 p.m.
At the time of the crash, the driver of the Honda proceeded through the intersection without stopping for oncoming traffic, St. George Police officer Jonathan McInnes said. 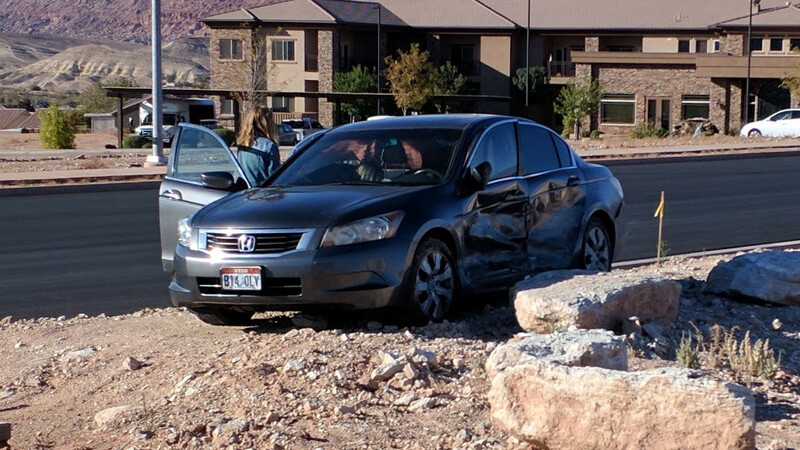 “She didn’t see the stop sign here at Sun River Parkway and Arrowhead,” McInnes told St. George News at the scene. As she went through the intersection without stopping, she was T-boned by the Toyota. In the aftermath of the crash, the Toyota came to rest in the middle of the intersection, while the Honda ended up off the road on the northeast side of the intersection. Medical personnel from Gold Cross Ambulance and St. George Fire Department responded on report of injury. The driver of the Toyota was transported to the hospital by ambulance. “She was alert and breathing fine,” McInnes said of the Toyota driver, adding that he didn’t know the exact extent of her injuries but that she was transported as a precaution. No other injuries were reported, and McInnes said everyone involved in the crash was wearing a seat belt. The driver of the Honda was cited for failure to yield at a stop sign, McInnes said. Both cars were heavily damaged in the crash and had to be towed from the scene. Wait, this doesn’t make any sense. Younger drivers have those lightning fast reflexes, remember? It’s the older drivers that are the problem. In fact, if that’s true, Sun River should be a demolition derby. So what gives?